today i’m hopping a train to new canaan, ct to visit the philip johnson glass house. they’re letting in members of the press today so i’m going to catch metro north and bring my camera to make sure i get lots of pictures. i’ll be back tomorrow with loads more but i wanted to share a craft project from last night. just like the drawer project, when i have leftover gift wrap i often find myself taping, decoupaging or sealing it to something in the house. 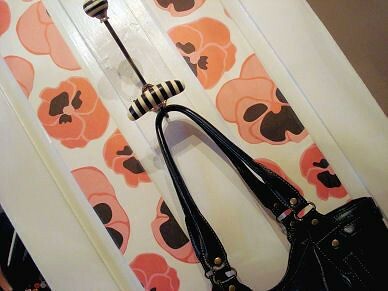 i decided to perk up my closet a bit (since no one sees it but me) by filling the door molding with paper source’s nÃ¶rsa luxe pansies wrap. i only needed two sheets and it took me all of 30 minutes to do. 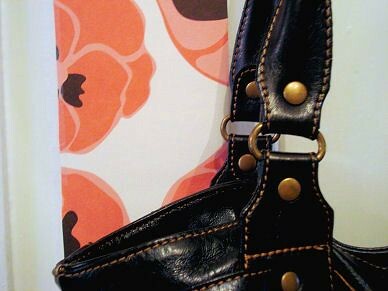 just measure well, cut to size and either use clear contact paper, tape or decoupage glue to secure it. i always suggest tape or contact paper if you’re a renter, but if you’ve found something you love, by all means glue away. you can pick up the gift wrap i used for $2.25 per sheet right here. Such a cute project, I will definitely be doing this at some point when I move into my new (old) place next year! Oh and great styling too, makes all the difference! That’s a cute bag, but now it looks even cuter! Nice styling. I *finaly* hung a wardrobe mirror last night, and now I can see I forgot the darn wallpaper behind it. Would have looked so good! I love the glass house, the design firm I work at actually got a very early reservation and had private tours a few weeks ago. Really inspiring! Your drawer project inspired me to tackle an old hutch that needed some updating… I love it now! 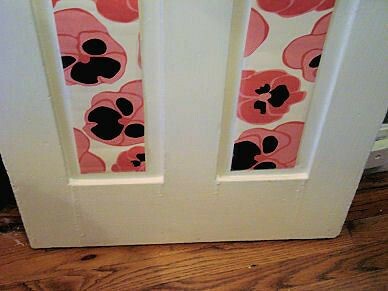 This is such a fun idea for doors too… Thank you. these great wrapping paper postings remind me of a project i’ve had on my to-do list for a while: covering the white cardboard magazine butlers from ikea (the 5 pak) with cute wrapping on contact paper. VERY INTERESTING VERSION OF AN OLD IDEA. Excellent idea! I love giftwrap so much, I am always keeping little scraps for something or other. Plus, the paper makes your bag look fantastic! love the punch of color! I love the paper…really adds some flair. I love your bag too! 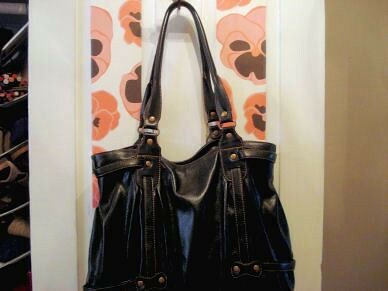 I have been looking for a bag like that. Love the idea and i REALLY love that bag. I’m wondering where it is from. thanks! the bag is from rare device, i believe it’s by matt and nat? I decoupage large pieces like dressers using beautiful papers. I like to sort of upholster the drawers by covering foam core cut to size with wonderful scrap fabrics. It’s very luxe. I often decoupage the in and outside drawer sides so it’s really fun to pull the drawers open and see the whole shebang. May I make give a hint? As a renter I’ve glued things to walls and doors. Using a hot iron with a towel or such between the iron and the wall will melt the glue enough to peel off the glued object. Depending on the amount of glue used you might have to sand down a bit but with a glue stick…100% off – the thing ironed off will be totaled. That really dresses up a door in a fast and easy way. That’s awesome. I may just do that!